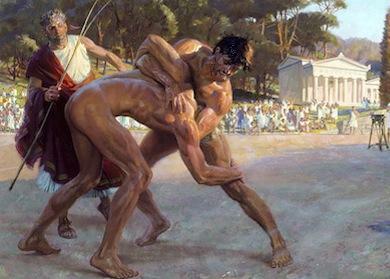 WHAT IS IT: AGOGE IS THE RIGOROUS EDUCATION AND TRAINING REGIME THAT WAS MANDATORY FOR ALL MALE CITIZENS EXCEPT THE FIRSTBORNS OF RULING HOUSES IN ANCIENT GREECE. WHEN DID IT START:AS SOON AS A CHILD WAS BORN IN SPARTA, THE MOTHER WOULD WASH IT WITH WINE, IN ORDER TO MAKE SURE THAT IT WAS STRONG. IF THE CHILD WAS WEAK, IT WOULD DIE SOON. LATER IT WAS BROUGHT BY HIS FATHER TO THE ELDERS, WHO INSPECTED CAREFULLY THE NEWBORN INFANT. IF THEY FOUND THAT THE CHILD WAS DEFORMED OR WEAKLY, THEY THREW IT INTO KAIDA, THE SO CALLED APOTHETAE, A CHIASM AT A CLIFF, OF THE MOUNT TAYGETOS.WHEN THE YOUNG SPARTAN BOY REACHED SEVEN HE WAS DEEMED TOO OLD TO BE CODDLED BY HIS PARENTS AND WAS TAKEN FROM THEM TO LIVE A MILITARY LIFE FOR THE REST OF HIS EXISTENCE. IT BEGINS: HE WAS PLACED IN A COMMUNAL BARRACKS WITH OTHERS HIS AGE, SUPERVISED BY AN OLDER BOY REFERRED TO AS A EIRENA WHO HAD RESPECTIVELY BEEN THE STRONGEST IN HIS CLASS (AND WAS HIMSELF UNDERGOING SOMETHING LIKE OFFICER TRAINING). FOR THE NEXT FIVE YEARS THESE SPARTAN BOYS WERE CONDITIONED PHYSICALLY AND MENTALLY. TRAINING: SPARTAN INITIATES WERE TRAINING IN RUNNING,JUMPING,THROWING SPEARS, MARCH, PATROLS, AMBUSHES AND MOCK BATTLES. EVERY AUTUMN, ACCORDING TO PLUTARCH ,THE SPARTAN WOULD PRO FORMADECLARE WAR ON THE HELOT POPULATION SO THAT ANY SPARTAN CITIZEN COULD KILL A HELOT WITHOUT FEAR OF BLOOD GUILT. THE KRYPTES WERE SENT OUT INTO THE COUNTRYSIDE WITH ONLY A KNIFE TO SURVIVE ON THEIR SKILLS AND CUNNING WITH THE INSTRUCTIONS TO KILL ANY HELOT THEY ENCOUNTERED AT NIGHT AND TO TAKE ANY FOOD THEY NEEDED. ONLY SPARTANS WHO HAD SERVED IN THE KRYPTEIA AS YOUNG MEN COULD EXPECT TO ACHIEVE THE HIGHEST RANKS IN SPARTAN SOCIETY AND ARMY. IT WAS FELT THAT ONLY THOSE SPARTANS WHO SHOWED THE ABILITY AND WILLINGNESS TO KILL FOR THE STATE AT A YOUNG AGE WERE WORTHY TO JOIN THE LEADERSHIP IN LATER YEARS. AT AGE 20 WAS THE END OF THE AGOGE AND MILITARY SERVICE BEGAN UNTIL THE AGE OF 60 . THE SPARTAN SOLDIER WAS HOUSED IN A PUBLIC BARRACS OF 15 OR SO TO EAT AND SLEEP. THIS WAS DONE UNTIL THE AGE OF 30 WHEN HE COULD LIVE WITH HIS WIFE. ANY SPARTAN THAT WAS WASHED OUT OF THE AGOGE WOULD SHAME HIS FAMILY AND THE BLOODLINE WOULD MOST IKELY NOT BE PERMITTED TO CONTINUE FROM THAT SON. This entry was tagged Ancient Greece, Education, Sparta. Bookmark the permalink.